The term paper piecing is a bit confusing because paper piecing is just one of the methods used for foundation piecing in quilts. However, the word paper has become the name most quilters associate with the technique. Flip and sew and sew and flip are two more descriptions you might hear when you read paper piecing patterns. Both describe the actions of sewing a foundation pieced block. String piecing is a popular "freehand" foundation/paper piecing technique. Don't confuse the term paper piecing with English paper piecing—that's a totally different construction method, where fabrics are folded around and basted to paper templates (hexagons are favorites). After basting, the shapes are hand sewn together along their edges (taking care to avoid the papers). Papers are removed before the project is completed. 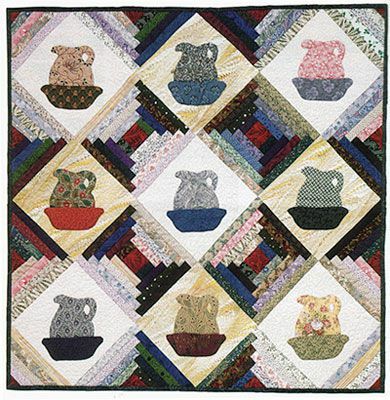 Pitcher's for Tildy's Cabin is a wallhanging made from a combination of applique pitcher blocks and paper pieced Courthouse Steps quilt blocks; Courthouse Steps is a variation of the traditional Log Cabin quilt block design and a perfect candidate for paper piecing. Little Oddfellows Star is a paper pieced miniature quilt. Foundation piecing isn't difficult, but it's different. Once you understand how to do it, you can assemble any foundation pieced block with few (or no) instructions. Be sure to begin by cutting only enough fabric to make a block or two, because everyone aligns patches differently when paper piecing. As you follow our suggestions make sure you test them out before you dive in and cut tons of fabric. This little paper pieced miniature quilt is made from sixteen 3" Whirlwind blocks and finishes at 21" square. The quilt blocks are quick and easy to make, but you might have to experiment a bit with patch placement​ because triangles can be a little challenging at first if the technique is new to you. After you've made a couple of foundation pieced projects, you'll know instinctively how to make them all. Through the Windows ​was inspired by a carpet we saw at a hotel in Arizona. Black sashing and corner triangles (at the tops and bottoms of strippy vertical rows) blend with the outer border, helping the quilt resemble a three-paned stained glass window. Blocks finish at 6" square and the completed quilt measures about 37-1/2" x 42". This pineapple quilt is made from thirty-five 9" square paper pieced pineapple quilt blocks. Two color layouts are used in the quilt, but you have the option of either sewing identical blocks for a more traditional look or going completely scrappy with a huge mixture of colors. This brightly colored table runner is from a Quilting Book that was published several years ago. It's an example of one simple way to combine string pieced quilt blocks. We used an assortment of fabrics to create the string blocks for this table runner and finished its edges with a lively border print (plus string pieced blocks at the corners). String piecing is a freeform type of foundation piecing. The technique gets its name from the long strips of fabric that are used—the strings, which are sewn randomly to a permanent foundation that's typically cut from muslin (but other materials can be used). This example of a string pieced quilt block was inspired by a quilt sewn in North Carolina during the Civil War era. The steps required to make the block vary just a bit from traditional string quilting, but are still very easy to accomplish. Traditional log cabin blocks are assembled with a split color value arrangement, lights on one side and darks on the other. Choose a scrappy assortment of light fabrics and another assortment of darks to make this paper pieced log cabin block. This block finishes at 6-inches square.